This is a companion post to The Importance of Grinding your own Flour. Both topics were discussed at our recent May gathering (Making and Using Sourdough, a Panel Presentation). 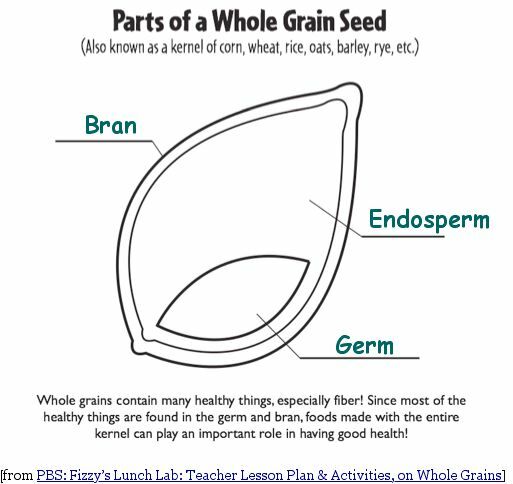 The USDA is really pushing the healthfulness of whole grains, putting them in the prime position at the bottom of their food pyramid (see below). But did you know that many of the nutrients in the grain are not available for absorption, including minerals and some vitamins? And that some components are actually toxic? No worries, though; all is made well by fermenting the grain (i.e., sourdough; soaking with yogurt or whey), or sprouting the seeds before grinding. NOTE: Since publication of this post, the USDA replaced their pyramid (above) with My Food Plate; see my recent post, link to left, for more. The USDA talks about all the nutrients provided by whole grains, but they are not telling the whole truth. Many of the nutrients in unfermented or unsprouted whole grains are not available for absorption. Some of the components of unfermented/unsprouted whole grains are actually toxic. See also: The Importance of Grinding your own Flour. As Ronny pointed out, unfermented grain (or flour from that grain) contains phytates which bind minerals so that we cannot absorb them (and are thus an anti-nutrient). But fermenting grain releases the minerals by breaking down the phytates. How does this work? I first learned about the problem of phytates from Nourishing Traditions by Sally Fallon with Mary G. Enig PhD.. To understand the good and bad side of phytates (salts of phytic acid), we need to talk a bit about what happens when a seed (like grain) germinates. Seeds are very important for the success of the species, so nature has equipped seeds with many defense mechanisms based on the structure and chemistry of the seed. The three parts of a seed are kept separate, to prevent the seed from germinating when conditions are not optimal. The germ is at the center of the seed. It is like an egg – the part that will form the new plant. 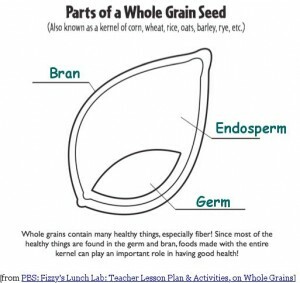 Surrounding the germ is the endosperm, much like a placenta surrounds an egg. Upon germination, the endosperm, which is mostly starch but also oils and protein, provides nourishment for the developing plant. The bran surrounds the entire seed, providing protection for the more delicate parts of the seed, and also providing important nutrients once the seed germinates, including oils and phytic acid (the storage form of phosphorus). Additionally, most grain seeds are surrounded by a hull which is removed before grinding; it provides no useable nutritional value. Some hulls, such as oat and barley, are difficult to remove, causing the bran and germ to be damaged in the process; for this reason, hulless varieties are now available (grown without a hull). Within the seed, various nutrients including vitamins, minerals, enzymes, sugars, starches, fibers and proteins are all kept separate by binders and inhibitors so they will not become active until conditions are ripe for germination. (For example, minerals are bound by phytic acid as phytates to keep them from activating enzymes). The required conditions for germination include moisture, oxygen, and temperature. When the time is ripe, these three factors induce remarkable changes in the seed. In the presence of warm moisture, phytase enzyme is activated to release the minerals from the phytates. These minerals in turn activate other enzymes, which, in the presence of vitamins and other cofactors, then create more vitamins and proteins for the development of the young plant. The energy for all this activity is obtained from the endosperm and bran, as well as oxygen from the air. Grain seeds (or flour ground from the seed) contain phytates that bind the minerals in the seed/flour. Furthermore, the phytates can also bind to minerals in your digestive tract. Such bound minerals are not available for absorption in the gut, because humans do not have the phytase enzyme. Germination and fermentation change all this, because they provide the phytase enzyme. Phytase breaks down the phytates to release the minerals, making them available for absorption. Some microbes, such as those that reside in sourdough, have the necessary phytase to release minerals from the phytates. As the sourdough starter works upon the flour in your recipe, it provides the moisture and phytase required to free the minerals. This makes them available for absorption in your gut when you eat the sourdough product. Lectins are widespread throughout the plant kingdom as a defense mechanism for the plant against its natural enemies: fungi and insects. But this defense mechanism may also negatively impact humans. All members of the grass family including wheat, spelt, kamut, oat, barley and rye have WGA lectin in the seed’s germ, but because wheat is highly hybridized to increase its protein content, it has a much higher level of lectin than the ancient grasses like spelt and kamut. Also, the lectins in modern wheat may be different, and more dangerous (health wise), than that in the older grains. Alpha-gliaden binds specifically to the sugar mannose, that is found in many fruits and vegetables. Unfermented whole grains (and flour) have both lectins intact (and white flour has the alpha-gliaden intact), so they can interfere with our health. But fermenting grain/flour, as in sourdough, at least partially breaks down the lectins, through the action of enzymes produced by the microbes in the sourdough. Using rye in your starter has an added benefit, in that rye, which is naturally low in gluten, has another component that assists the rise of bread: pentosans, which are highly viscous polysaccharides that enable the dough to hold CO2 gas produced by the fermentation. This entry was posted on Sunday, May 22nd, 2011 at 10:59 am and is filed under Food-Nutrition-Health, Health. You can follow any responses to this entry through the RSS 2.0 feed. Both comments and pings are currently closed.